The perfect gift for any golf lover. Do you know your albatross from your eagle? Your birdie from your bogey? Whether you're a golfing pro or simply a Sunday driver you'll enjoy working your way around the nine chapters of The Golf Pocket Bible. 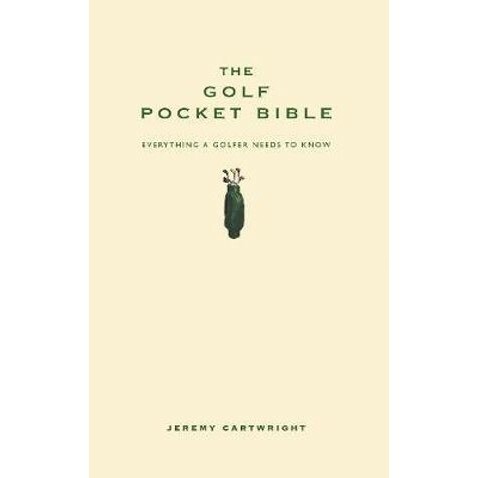 Beginning with the myths and legends surrounding the sport's origin, The Golf Pocket Bible follows a course from the rules of the game, through the rough and smooth of famous wins and losses to the final test of a golfing quiz. Discover the history of golf, explore famous golf courses from Gleneagles to St Andrews and Pebble Beach and learn fascinating facts about major golf tournaments from the Ryder Cup to the US Open. Inside this pocket golf guide you'll also find profiles of famous golfers from Colin Montgomerie and Nick Faldo through to Seve Ballesteros and Tiger Woods all at your fingertips, as well as a list of the best (and worst) golfing films. Golf enthusiast Jeremy Cartwright divides his working life between England and Australia. In the former he spends much of his time in Thame at the famous Oxfordshire Golf Club.